Strong national climate governance frameworks are crucial to establish and maintain political support for the low-carbon transition and facilitate the implementation of policies. The truly robust governance frameworks combine key elements such as legally binding targets reached with high level of political support, broad stakeholder participation and review mechanisms that allow for adjustments over time. Creation of dedicated institutions with clearly assigned responsibilities and powers is essential to ensure the robustness and effectiveness of the framework. Why do we need strong national climate governance frameworks and how do we get there? 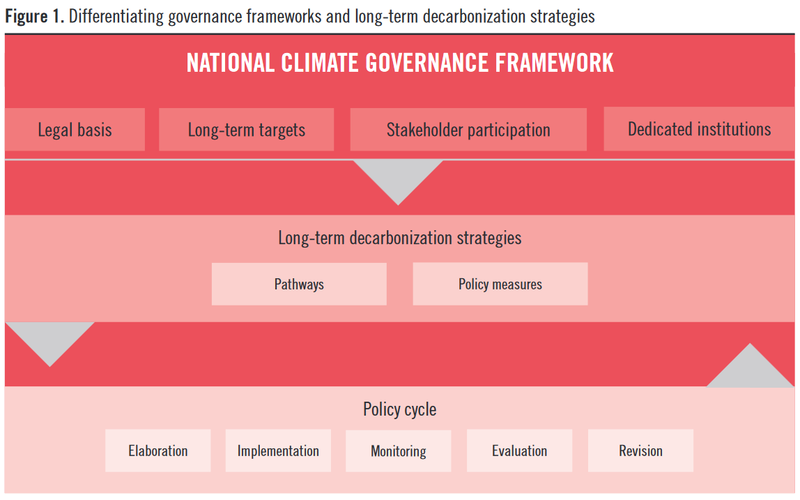 What are the key ingredients for an effective national climate governance framework? What are the linkages and resulting challenges arising from the links between national and multinational governance frameworks? Legally enshrined governance frameworks are crucial to establish and maintain political support for the low-carbon transition and facilitate the implementation of policies. They provide a platform for the political debate, define the tools to establish credible long-term goals and strategies, and set out clear transparency and monitoring mechanisms to enhance transparency and compliance. Firstly, the robustness of the framework defines its ability to steer the low-carbon transformation over time, depending on the degree of high-level political support, stakeholder participation, the legally binding nature of targets and mechanisms to adjust the framework over time. In terms of effectiveness, it appears essential to secure the ‘right’ level of ambition of targets. In most cases, this might require a gradual approach to ensure the compatibility with the Paris Agreement (i.e. moving towards climate neutrality) and safeguard high levels of political support. Strong coordination between long-term planning and short-term implementation and clear processes to monitor, evaluate and adjust the strategy appear as key conditions to foster effective implementation. Finally, the institution set-up can significantly foster both the robustness and effectiveness of the framework, based on the creation of dedicated institutions with clearly assigned powers, responsibilities and accountability mechanisms and a clear role for independent expertise. The current reform of the EU energy and climate governance framework presents an opportunity for the EU and its member states to preserve their reputation as a climate leader and protect Europe’s ability to reap the socio-economic dividends of being an early mover on climate action. However, to be fully effective and create additional value for the implementation of climate action at the national level, the EU framework has to ensure that the key elements of the Paris Agreement, including the ambition cycle and long-term vision, are fully reflected in the governance frameworks at the EU and national levels. The study is part of a research project coordinated by IDDRI, the Ecologic Institute and LSE’s Grantham Research Institute on Climate Change and Environment. It summarises three existing publications about the best practices and challenges for effective climate governance frameworks, drawing from a range of case studies at the national, regional and city-level (Duwe et. al., 2017), as well as deeper studies on the experiences of the UK (GRI, 2018) and France (IDDRI, 2018). Rüdinger, A., Voss-Stemping, J., Sartor, O., Duwe, M., Averchenkova, A. (2018). Towards Paris-compatible climate governance frameworks. An overview of findings from recent research into 2050 climate laws and strategies. Studies N°04/18, IDDRI, Paris, France, 20 p.